Sai Sahan was a Redguard swordmaster and Captain of the Dragonguard. He was renowned for liberating the city of Leyawiin. A member of the Five Companions, he fled with the Amulet of Kings when the Soulburst occurred. He managed to hide the Amulet in Sancre Tor, but he himself was imprisoned in the Halls of Torment. 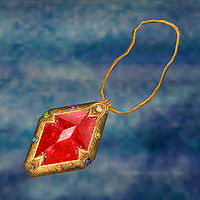 After his rescue by the Vestige, they recovered the Amulet of Kings. Son of Nazir Itaf Sahan of Bangkorai, Sai Sahan trained in the arts of war with his friend Kasura. He spent years training in solitude as he attempted to revive the lost Yokudan art of sword-singing, but he ultimately failed, resulting in his self-doubt. Despite this, he retained a strong will and sense of self. He dreamed of a reunited Empire, and thus swore to protect Emperor Varen Aquilarios to see that dream achieved. Varen made him Captain of the Dragonguard. Sai Sahan also trained many of the captains himself. During the war against Emperor Leovic, he was tasked by Varen to free the settlement of Leyawiin. He was given a group of mercenary soldiers for assistance, but they turned out to be Leovic's own agents. Faced with two armies, Sai Sahan emerged victorious, returning to the rebellion base at Bruma weeks later with eighty-six scalps and news of the city's liberation. Accounts of the battle vary: some believe he single-handedly liberated Leyawiin in one battle, while others say he murdered the guards for days until the Reachmen eventually left the settlement with their mercenaries. Sai Sahan joined the Five Companions, a group of adventurers who sought the Amulet of Kings to use to rekindle the Dragonfires. The Amulet was found and a ritual prepared to persuade Akatosh to make Varen Dragonborn. However, when the ritual commenced in 2E 579, it was corrupted by Mannimarco, causing the Soulburst. Varen vanished during the catastrophe, allegedly consumed by the blast, while Sai Sahan fled with the Amulet of Kings. 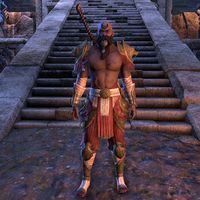 He and Lyris Titanborn were suspected of playing a part in Varen's death, a claim that was supported by the fact that he fled as soon as he recovered. He was eventually imprisoned within the Halls of Torment, subjected to torture in an attempt to extract information on the Amulet of Kings' location. While he resisted the torture, he was not completely unharmed. He was saved by the Vestige, who accompanied him back to his ancestral home to find out how to enter Sancre Tor and recover the Amulet of Kings. Now having recovered from the torture, he guided the Vestige to the Amulet.. After his rescue, he also contributed to recording the history of the Five Companions. Esta página foi modificada pela última vez à(s) 02h27min de 29 de agosto de 2014.